The other day, my little MacBook stopped working. It's not my principal computer--I do most of my writing on the Desktop--but I had no idea how much I'm hooked into the little one for email and Facebook and Youtube and all kinds of other things over the course of a day. Apple had it only four days. 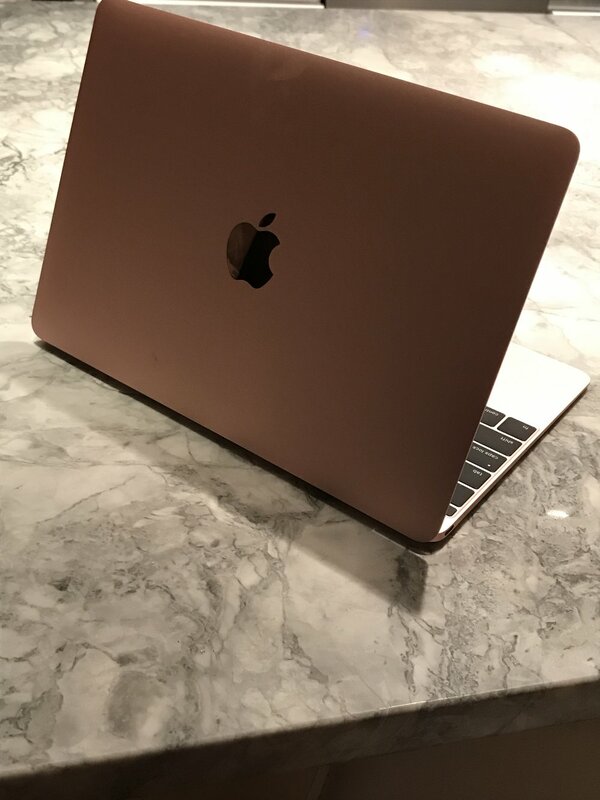 I picked it up today--new logic board, new keyboard, new IPD to MLB flex cable, new TCON flex cable--and it's working great. But for those four days, I went nuts missing it. Addiction. There's been so much in the news about addiction lately--without so much as a hushed whisper, opiate addiction seems to have reared its ugly head as an extremely distressing problem in certain areas of the country. That's depressing, and hopefully it will be addressed successfully and soon. But there are so many other forms of addiction that we tend not to think much about. And as I spent the last few days gnashing my teeth about my absent laptop, I thought about many of them. Because this is the "Dog Blog," I feel I should discuss my dog addiction. I cannot remember a time when I didn't have a dog. In fact, having only one now seems a little sparse. I was walking down First Avenue yesterday, and there was a woman walking what might have been the cutest dog I've ever seen. People often like to stop for a moment and talk about their dogs, and I commented on how adorable hers was, not only in looks but also in personality. Not only did she want to stop and talk about her dog, but she let me take a picture. She gave me the name and website of the breeder. (And now I'm afraid I'm going to have to beg my friends to "talk me off the ledge" about this one. I CAN'T get a second dog. But this dog was SO cute! But I CAN'T get a second dog.) I do think I am addicted to dogs. Rarely do I see one on the street that I don't feel like meeting. I have no clue why I feel this way, but I have no desire to try to analyze it. Dogs! They are certainly high maintenance, but they give back at least as much as they take, and more. They don't hold grudges. They give unlimited love. They're just cool. Is my music an addiction? I don't know whether to call it that. It's something that's been a part of my soul and being all my life. Although I didn't choose to make music my profession, I cannot imagine having lived my life without it. It brings an incredible amount of joy--playing it, singing it, hearing it. Addiction is something that once you have it, it requires you continually increase your intake of whatever the addictive substance is to feel the same "high." I suppose that's somewhat true of my music. No matter how much I do, I want to do more. 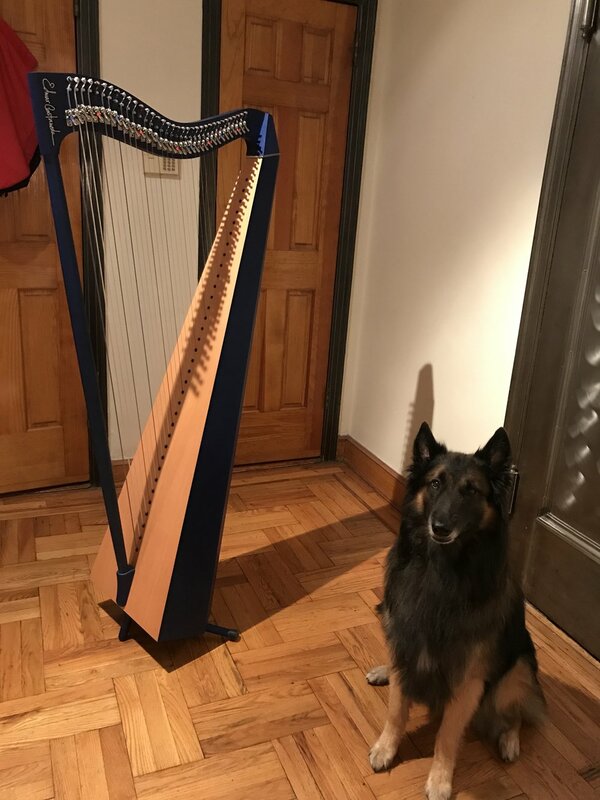 Playing harp has always been my "heart's desire," and somehow I gave myself the opportunity to do it, even at this late stage. And a concert harp wasn't enough--I "had" to play the llanera harp. Addiction? Moki tolerates my practicing, sometimes with a groan, sometimes with a sigh. So, dogs and music. All things considered, if you're going to be addicted to something, those two things are pretty good things to be addicted to! Then there's the actual substance to which I am unabashedly addicted--coffee. Yup. I love the stuff. I have a strange relationship with coffee. It never keeps me awake. I can drink it at 11:00 at night and then sleep like a baby. So I don't think it's the stimulant part that grabs me. I'm not sure what is. I've heard people say coffee smells better than it tastes. For sure, it smells so divine, the smell can send me into some kind of euphoric state. I could stand in a place that sells coffee beans all day, just breathing in the smell! But great coffee tastes wonderful too, and it provides some sort of holistic aura that just feels great. 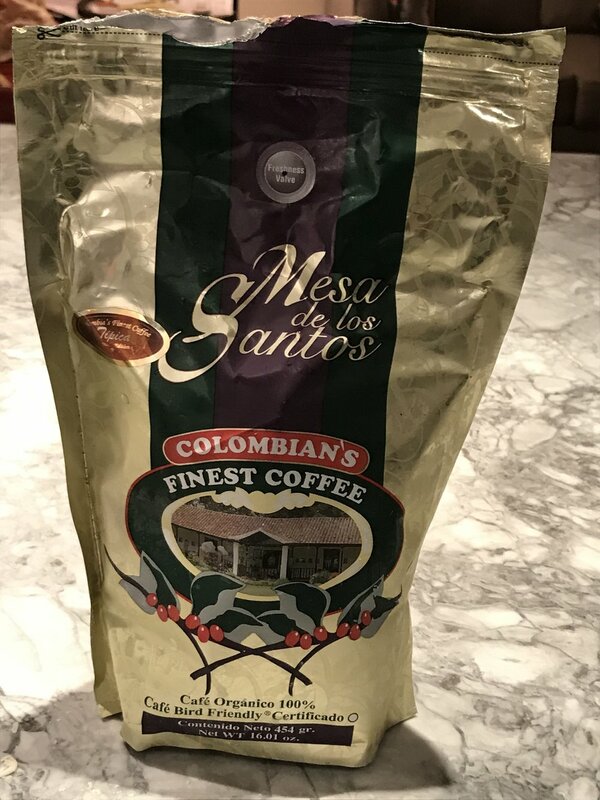 My Colombian friend Andrés gave me a bag of coffee from Colombia, and I'm not sure whether I should hug him or slap him for that, because it's probably the best coffee I've ever had, I'm drinking way too much of it, and no other coffee is ever going to taste as good again! Of course, I have to mention the writing. It's been part of every job I've had. Technical writing, legal briefs, contracts--I always managed to slide myself into the part of whatever job I had that required it. Fiction writing was always the goal, and the fact that I have a publisher who will publish all my books is just the icing on the cake. It's been so great writing mystery and time travel and historical fiction--doing the research, coming up with the ideas, which seem to evanesce out of nowhere and form into plots and characters by themselves. 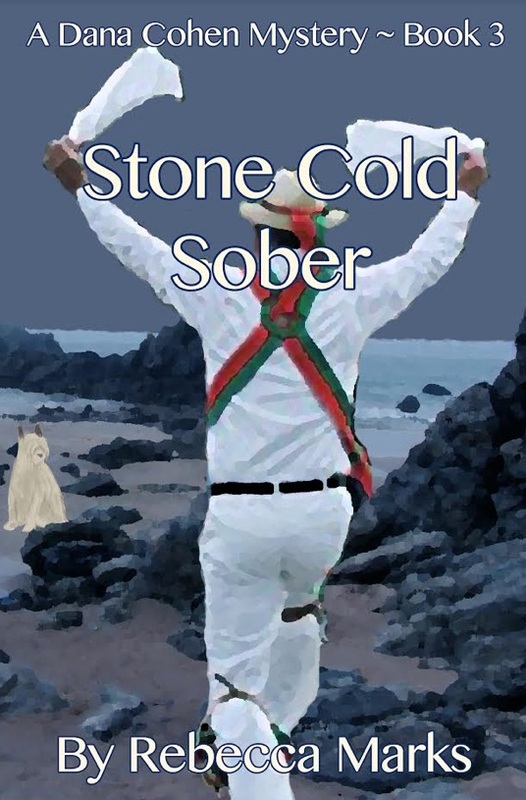 It was such fun to introduce my latest Dana Cohen book, Stone Cold Sober, into the world. Dana has become such a part of me, I can anticipate every thought she has, every action she does (although she still surprises me sometimes). I heard from my publisher, Black Opal Books, today that book 4, Old Fashioned with a Twist, is scheduled for publication in January. That's exciting! But it also tells me I have to get on the stick and finish book 5, which is sitting on my Desktop right now. So I will end this blog and get back to writing the longer stuff! I guess the point is that addiction is not always evil, and I'm pretty sure most people are addicted to something. In my case, I'm happy that I am!